As a new patient at IVC you will receive a personalized treatment plan based on your specific venous disease. 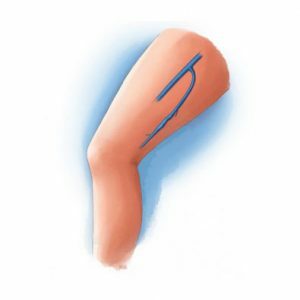 Normally, this consists of treating several veins in each leg through a combination of ablation, sclerotherapy, and ambulatory phlebectomy. Many patients need 2-3 treatment days and 2-3 follow up visits to complete their entire treatment plan. It is possible for a patient to receive fewer treatments than what was originally planned. Typically treatment starts with endovenous thermal ablation which uses heat to close down the larger superficial veins such as the greater and smaller saphenous vein. These veins are responsible for the majority of the blood flow in the superficial system. As these veins begin to fail and blood flow becomes less efficient, stress is placed on the smaller veins that feed these larger saphenous veins. This stress is caused by pooling blood that forces the vein to become larger in diameter and can eventually damage the valves in these smaller branching vessels. After treatment of the larger saphenous veins the patient will follow up after one week. At the one week appointment not only do we assess that the treated vein is properly closed and that there is not a blood clot from the treatment, but we also check the remaining veins on the treatment plan to see if they are still refluxing and need treatment. It is not uncommon after treatment of a larger saphenous vein that the stress is taken off of the smaller branching veins. These smaller branching veins can become smaller in diameter and may even become competent. If this occurs, we will discuss these changes with the patient. These veins will be removed from the treatment plan as they are now functioning normally and no longer require treatment.